This is the perfect breakfast to wake up to in the morning! 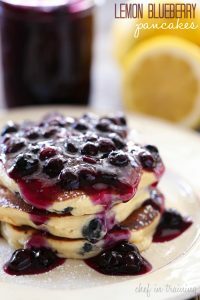 The lemon blueberry combo is amazing and the blueberry sauce is the perfect finishing touch! In a large bowl, combine flour, baking powder, sugar, salt, and baking soda and whisk to evenly distribute ingredients. Add the buttermilk, lemon juice, lemon zest, oil and egg. With a large wooden spoon, mix all ingredients and beat until smooth. Fold in blueberries. If batter seems to be too thick while you’re cooking the pancakes, add a little more buttermilk and mix well. Heat a skillet or a griddle over medium-low heat. Brush with a little oil or spray with nonstick cooking spray. Pour in batter to desired size. Let the batter start to show small bubbles on top before you turn the pancake over to finish cooking. Cook the pancakes until golden on both sides. In a medium saucepan over medium heat, cook water, sugar, and cornstarch until thickened. Stir in blueberries and simmer for 10 minutes. Add butter and stir until melted. Serve over the french toast.